There are many advantages to being in Florida. Besides the beaches and the water, the weather may be the biggest asset. And what could be better than to ride around the State in a motorcycle, wind in the face and through the hair? Just the thought of biking down US 1 from Miami to the Keys, with the wind and the water on both sides, evokes pleasant feelings in many people. However, biking does have a big disadvantage – being on two wheels may result in not being seen by vehicles of the four- (or more) wheeled variety. And, unfortunately, motorcycling accidents can be catastrophic. Recently, a Zephyrhills woman, who was a passenger on a motorcycle and was wearing her helmet, was killed when the motorcycle on which she was riding rear-ended a car and she was thrown. While this situation is atypical of accidents involving motorcycles, as most of them involve a four-wheeled vehicle initiating the contact with the motorcycle, it nevertheless illustrates the inherent risk involved with motorcycle operation. 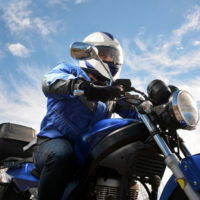 Some tips to keep one safe while riding a motorcycle, as well as a discussion of what to do if injured in a motorcycle accident, will follow below. Safe motorcycling involves all those who operate vehicles on the roads, including four- (or more) wheeled vehicles. Most important for these operators is to realize that motorcycles are also on the road, and, as such, to share the road. It is important for motorcycle riders to realize that they are less visible to other drivers, and are susceptible to more extenuating injuries if in a crash because motorcycles provide almost no protection of the body. Further, motorcycle riding demands balance and coordination from the driver. Thus, it is important that a biker is prepared for the challenges of operating his/her motorcycle on the roads. Confirm placement of cargo prior to loading. Unfortunately, accidents do happen, and if it does, it helps to be prepared, not only to tend to immediate and lingering injuries, but also to help an experienced motorcycle accident attorney develop a case against the person’s responsible. First and foremost, get medical treatment for all parties. This is important, as some injuries do not manifest themselves until well after the accident. Second, call the police immediately. If they refuse to show up (if there does not seem to be anyone injured), be sure to record the vehicles involved, as well as obtain the license and insurance information of all those involved. Also, speak to any witnesses, and get their contact information. Third, document the scene, preferably via photograph, before any vehicles are removed from their final location. Further, document any injuries – although it is probably best to have a physician do this. Finally, obtain the services of an experienced motorcycle injury attorney as soon as possible. Also, to this end, once you have secured legal representation, do not speak to insurance companies other than your own without the permission of your attorney. The attorneys at Pita Weber Del Prado have the experience to determine whether liability for your injuries fall to another party, and, if so, will fight to get you the compensation you deserve. Contact our Miami office today for a free initial consultation.